Rally Fee: $180 plus a small Nebraska state park fee. Trish and Mel Legg invite you to the Mormon Island Bus Rally of 2014. 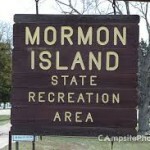 The location of the rally this year will be Mormon State Park in Nebraska.